• Location: River Mile 723.8. • River Elevation: 646 Feet. • Railroad: Winona Bridge Railway. • Daily Traffic Count: 0 (Bridge Is Removed). • Bridge Type: Steel Truss w/Swingspan. • Length: 2,630 Feet, 360 Foot Longest Span. • Navigation Channel Width: 210 Feet. • Height Above Water: 20 Feet (Estimated). • Date Built: Opened August 1, 1891. 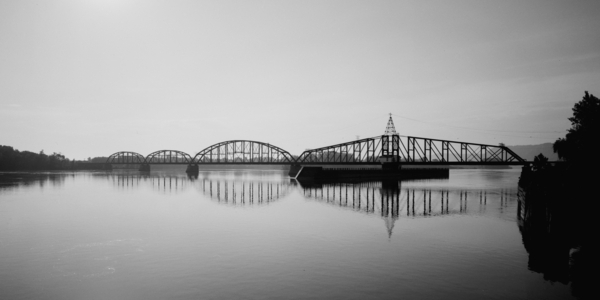 The Winona Bridge Railway was organized in the late 1880s to own and operate a second railroad bridge over the Mississippi River at Winona, Minnesota. The bridge idea was conceived of by the Winona & Southwestern Railway. Congress granted a charter for the bridge, but required that it be open to anyone who was willing to pay the bridge toll. This was the first bridge over the Mississippi River to be required to be open access. Since both the Chicago, Burlington, & Northern and the Green Bay, Winona, & Saint Paul railroads both wanted to use the bridge, the Winona Bridge Railway was created to with these two railroad in partnership with the Winona & Southwestern. The crossing was a single track capable of supporting a moving load of 3,000 pounds per linear foot. This was heavy for its time, but was light for a bridge after World War II. The truss spans were a combination of steel and wrought iron. The tie bars and boom chords were steel, but all other parts were iron. The modification to the standard Pratt truss style was that the top of of the trusses were rounded rather than horizontal. The swing span was mounted on a circular pier that was 30 feet in diameter and was powered by a 20 horse steam engine. While the Winona Bridge Railway was successful, the three partner railroads did not fare quite as well. The Winona & Southwestern went bankrupt in the panic of 1893. It was sold to the Winona & Western, which later became part of the Chicago & Great Western, the Chicago & North Western, which is now part of the Union Pacific. The Green Bay, Winona, & Saint Paul Railroad went into bankruptcy and was sold at foreclosure in 1896, where its rights to the WBR were purchased by the Green Bay Route. The Chicago, Burlington, & Northern did enjoy success with its partner relationship with the Chicago, Burlington, & Qunicy, but it ceased to be an independent railroad when it was purchased outright by the CB&Q in 1899. The CB&Q became part of the Burlington Northern, and operates today as part of Burlington Northern Santa Fe Railway. Traffic over the WBR began to wane in the latter half of the 20th Century due to the bridge not being able to handle modern 100-ton rail cars. The bridge was closed in 1985 due to the trestle sections having deteriorated. The Burlington Northern had plans to create a new bypass route to Seattle, and purchased the Green Bay Route's share of the WBR. However, that plan fell through. A section of the bridge burned on December 17, 1989. It was decided to not repair the structure, so it was dismantled in 1990. 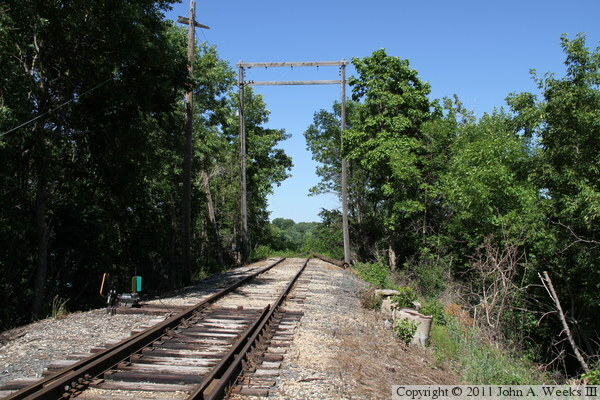 The tracks leading to the west end of the Winona Bridge Railway still exist and are still in use. 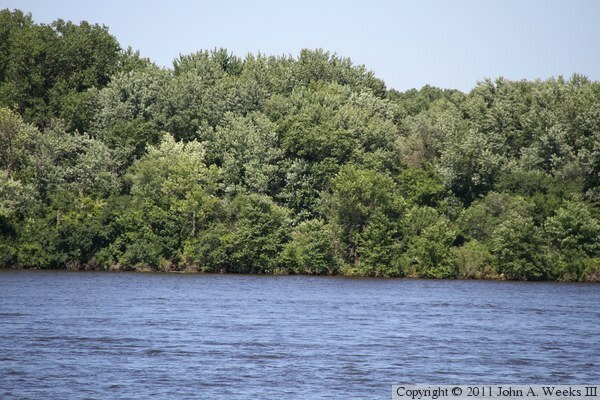 A section of embankment still extends into the the channel of the Mississippi River. This can be seen from a levee that runs along the river, with access from a boat landing located just downstream. I haven not visited the east side of the Mississippi River, but aerial photos suggest that a section of embankment still exists on the Wisconsin side of the river. 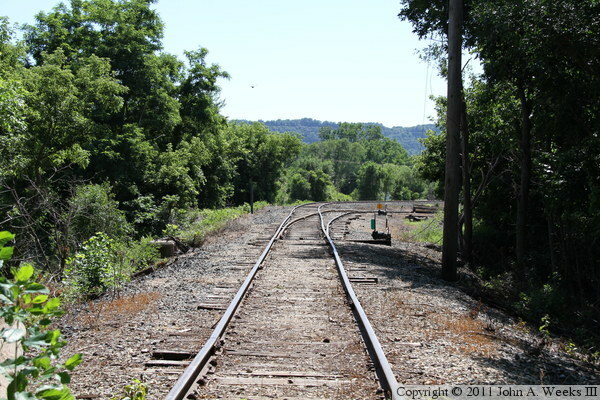 The photo above is looking northeast towards the end of the tracks where the Winona Bridge Railway once crossed the Mississippi River. The photo below is looking northeast across the river where the MBR bridge once crossed the Great River. These two images are public domain photos from the Historic American Engineering Record. The photo above is looking north across the river towards the downstream face of the MBR. The photo below is looking downstream to the east towards the upstream face of the structure. 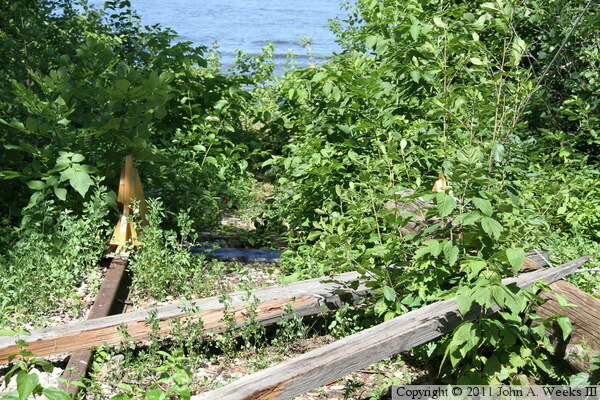 The photo above is the very end of the tracks at the end of the bridge embankment on the Minnesota side of the Mississippi River. The yellow devices are to prevent rail cars from rolling off of the end of the track and into the river. 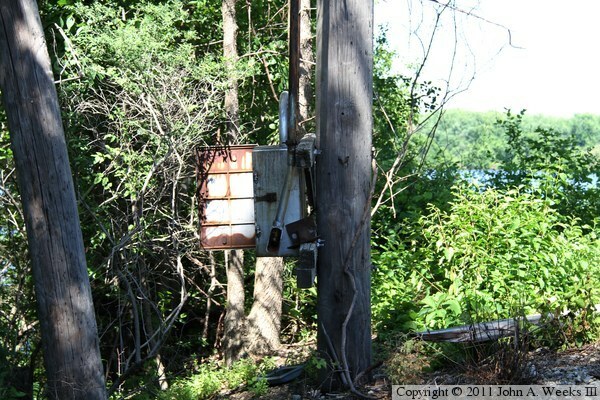 The photo below is an electrical controller box on the upstream side of the railroad track. 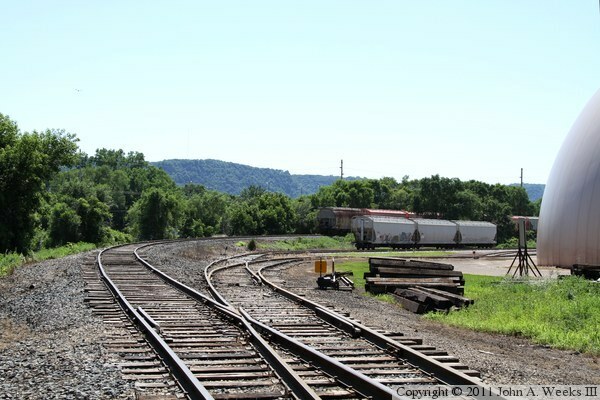 These two photos are looking west towards Winona from the bridge embankment. A single track lead to the bridge (above), but several other tracks converged just before the river from a small yard that currently serves a grain terminal. 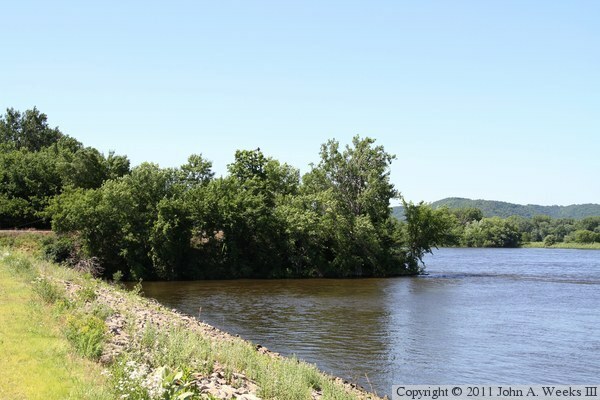 The photo above is looking upstream towards the railroad embankment that led to the swing span on the Minnesota side of the river. 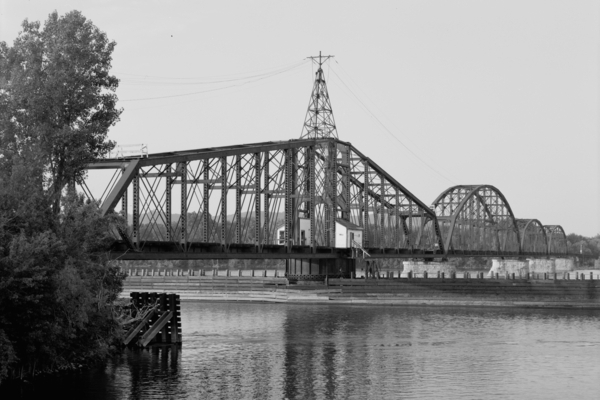 Newspaper accounts indicate that there was a 270 trestle span on the Minnesota side of the river, with a pier located in the river just beyond the end of the embankment. 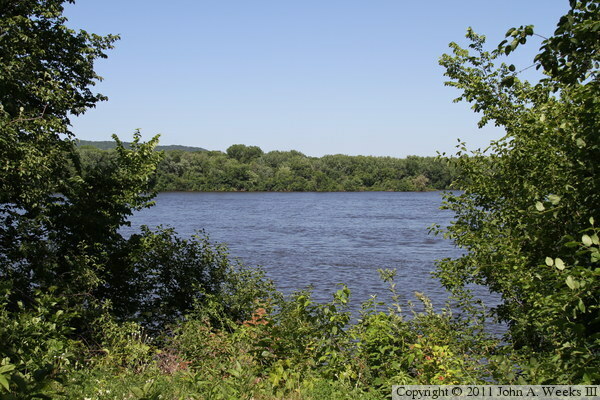 The photo below is a close view of the Wisconsin side of the main river channel. There is a small thin island in front of the taller trees in the background. A trestle crossed the small island just to the left of the center of the photo, and passed through the mainland where there is a large V in the trees to the right of the center of the photo.